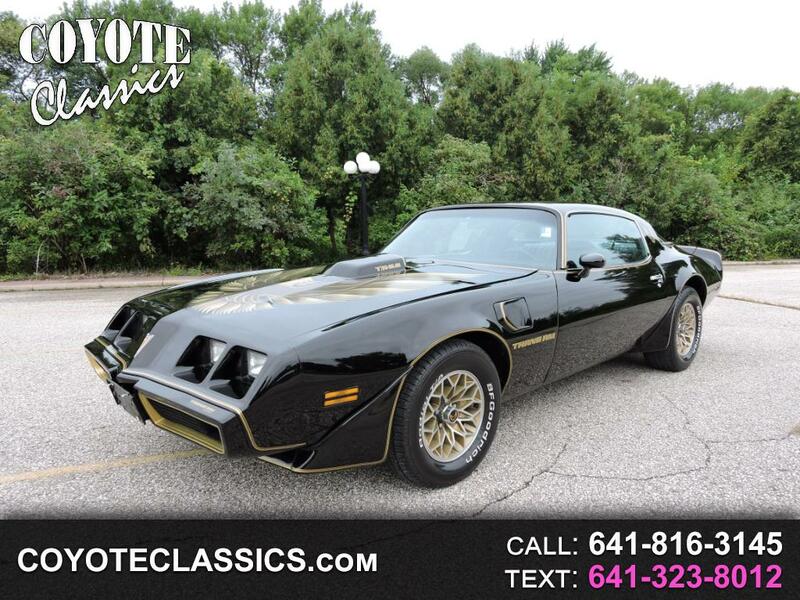 Ready to cruise and enjoy is this Sharp Looking and Great Sounding 1979 Pontiac Trans Am Done in a Beautiful Black/Gold Bandit paint scheme! Its exterior black paint is laid out beautifully over a very straight body. Its black bucket seat with console interior is also done very nicely. Its powered by a very healthy running and sounding 400 4bb V8 engine and is backed up by a automatic transmission. It comes equipped with power steering, tilt wheel, power windows, flow master dual exhaust system, front power disc brakes, radial tuned suspension, Sony am fm CD stereo, and is riding on a refurbished set of Snow flake rims with BFG RWL tires. This a great driving and super sharp TA that's ready to hit the streets with authority! Visit Coyote Classics online at coyoteclassics.com to see more pictures of this vehicle or call us at 641-512-4727 today to schedule your test drive. Message: Thought you might be interested in this 1979 Pontiac Trans Am. Call us today before your dream drives away! Our inventory changes daily.